They lock up and Rollins with a side head lock and Rollins holds on when Balor tries to send him off the ropes. Balor with arm drags into an arm bar. Rollins backs Balor into the ropes and Rollins with an arm drag and shoulder tackle followed by a kick. Rollins with a chop and punches followed by kicks in the corner. Rollins with a snap mare into a reverse chin lock. Rollins with a knee to the midsection and he goes for a sunset flip and Balor rolls through and drop kicks Rollins. Rollins is sent to the floor and Balor with a running kick on the apron. We are back and Rollins with forearms in the corner. Rollins with a blockbuster but he holds his knee after landing. Rollins with a running knee to the back to send Balor to the floor. Rollins sets for a suicide dive and he hits it but Rollins holds his knee as he lands on the floor. Rollins with a neck breaker and he gets a near fall. Rollins with a cravate and a knee to the midsection followed by a forearm to the back of the head. Balor with forearms and Rollins with an elbow to the back of the head. Rollins with an elbow to the head and Balor with a boot and running forearms. Balor with a double leg take down and a double stomp. Balor with a running chop into the corner and then he floats over but he runs into a boot. Balor with an enzuigiri followed by a elbow to the chest. Rollins avoids Slingblade and hits his own for a near fall. Rollins with running forearms into the corner and then when he goes for a third one, Balor with Slingblade. Rollins with a super kick for a near fall. Balor with an elbow and chop followed by forearms. Rollins sets for the V Trigger but Balor with a forearm. Rollins with an enzuigiri and both men are down. Rolins goes up top for the Phoenix Splash but Balor moves and Rollins lands on his feet. Balor with a running drop kick that sends Rollins into the turnbuckles. Balor goes up top for the Coup de Grace but Rollins recovers and hits a superplex and then rolls through into a Falcon Arrow for a near fall. Rolllins goes up top again and he goes for a frog splash but Balor gets his knees up and Balor gets a near fall on a rollup. 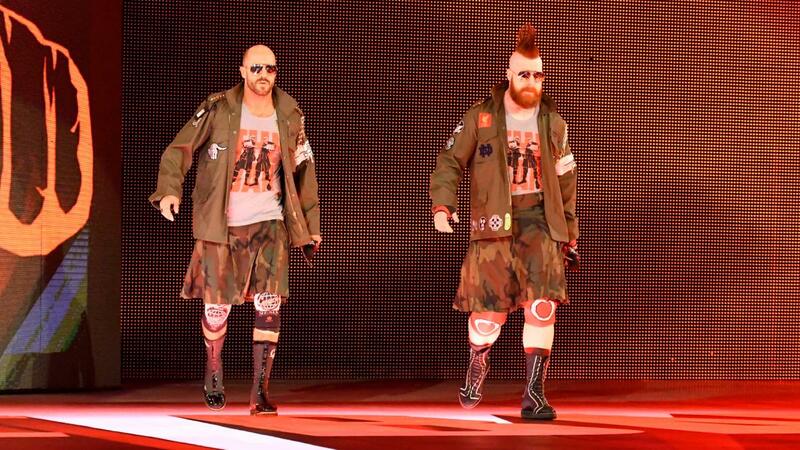 Sheamus and Cesaro’s music plays and they make their way to the ring. They go after Jason Jordan who is blocked by Gallows and Anderson and they miss Jordan and hits Gallows and Anderson. Balor with a plancha onto Cesaro, Sheamus, Anderson, and Gallows. Balor with an enzuigiri and he goes up top for the Coup De Grace but he misses. Balor with a forearm to Cesaro. Jordan trips Balor and Rollins with Black Out for the three count. Kurt Angle is on the phone talking about someone for the Women’s Royal Rumble and how they would be great even though they were not in the ring for a while. Sheamus and Cesaro show up and they ask about their rematch. Sheamus says that Kurt is keeping Jason Jordan away from him. Cesaro says it smells like favoritism. Kurt says they will have the opportunity to reclaim the tag titles at the Royal Rumble. Sheamus likes that and he asks about tonight. Kurt tells them to go to the ring so they can find competition. Titus and Sheamus start things off and he avoids Titus for the lock up and he goes into the ropes to get into Titus’ head. Sheamus with a kick and side head lock. Titus with a forearm and running shoulder tackle. Crews tags in and he comes off the turnbuckles with a double sledge. Cesaro tags in and he connects with a European uppercut in the corner and another European uppercut. Crews with a forearm but Cesaro with a European uppercut and reverse chin lock. Crews with a drop kick and standing moonsault for a near fall. Crews goes for a suplex but Cesaro lands on his feet. Sheamus makes the tag and he goes over the top rope when Sheamus pulls down the ropes. Crews holds his knee and Dana checks. Sheamus with a knee and he sends Crews into the ringside barrier. They return to the ring and Cesaro tags in and they make a wish. Cesaro with a punch and chin lock. 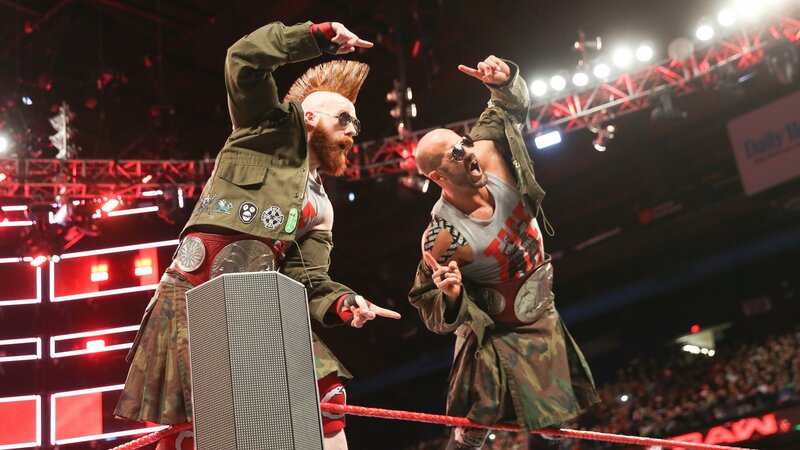 Sheamus distracts Titus and Cesaro with a clothesline to the back of the head and Sheamus with a knee on the apron. Sheamus tags in. Crews avoids Cesaro and he goes to the floor. Sheamus misses a Brogue Kick on Crews and he hits a moonsault onto Cesaro. Titus with a rollup for the three count. Kurt Angle wishes everyone a Happy New Year. He says that 2018 will be even greater than 2017. In three weeks RAW will celebrate its 25th anniversary. Then talks about the Royal Rumble and that John Cena entered. He talks about the rules of the Royal Rumble, same rules apply for men and women. The winner gets his and her opportunity at a title shot at Wrestlemania. The Bar’s music hits and they make their way to the ring. Sheamus says that they were robbed last week. “You look stupid” chant breaks. Cesaro says that they cannot stand favoritism. He gave his son a tag team title shot. What he did after the match was too much says Cesaro. They shows a clip of last week’s main event, with Kurt Angle applauding and hugging Jason Jordan. The Bar asked for a rematch tonight. Kurt Angle says that they will get their rematch when he says so. Jason Jordan’s music hits and he comes out. Jason says that if he didn’t deserve an opportunity at the tag team titles, then why does he have the title? Jason says last week’s opportunity was based off his track record not his DNA. Seth and him earned the tag titles. They start arguing, then Kurt Angle makes a match right now. Seth Rollins comes out. Seth tells Jason that even though they are tag champions, he has a lot to learn about being a teammate. Seth explains that Jason was outnumbered right now. That needs to stop being so self-absorbed. Seth tells Jason that he will be in his corner tonight, but the way he sees it, he is out here tonight to watch him lose. Jordan vs. Cesaro up next. Uppercut by Cesaro. Jason fights back with a drop kick and a cover, 1,2 and Cesaro kicks out. Jordan has Cesaro in the corner, Cesaro fights back with an uppercut again, and then again. Takedown by Cesaro and applies a sleeper hold. Jordan gets up and fights back. He picks Cesaro and runs into the corner with him. 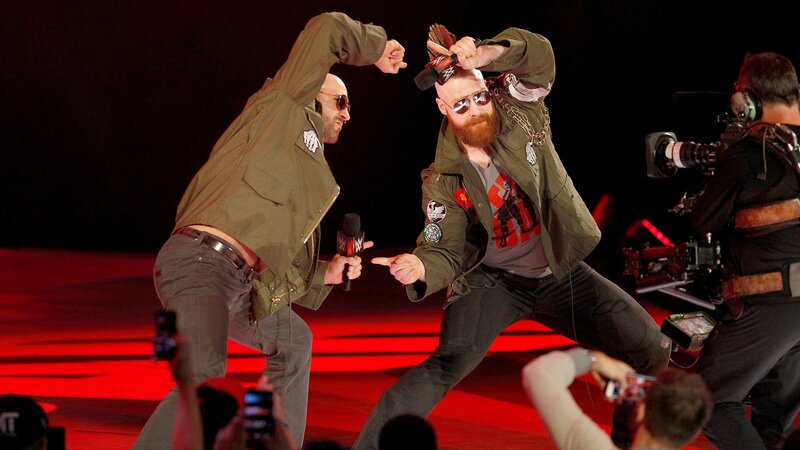 Sheamus gets up on the apron to distract Jason, this allowed Cesaro to attack Jason’s knee, while distracted. Cesaro continues to work on Jason’s left leg/knee. Both men are up and Jason clotheslines Cesaro and then back body drops him to the outside, while limping on his leg. 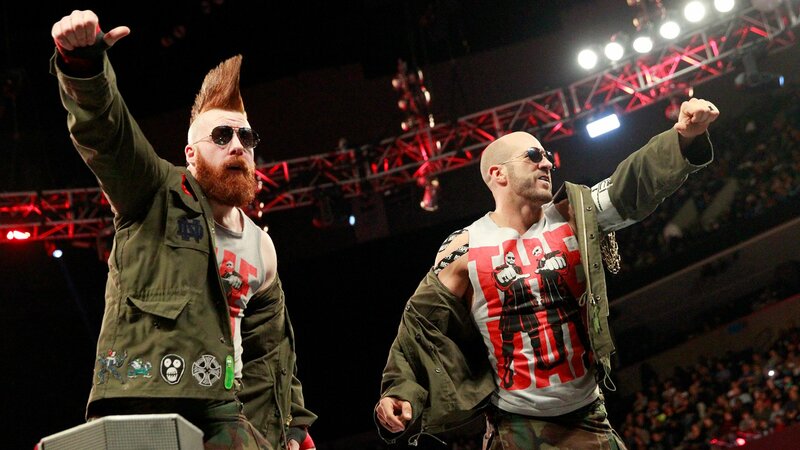 On the outside, Cesaro attacks Jason’s leg again, then high fives Sheamus. Cesaro still in control and we see Jason down on the outside. Cesaro throws him back in. Uppercut by Cesaro. Cesaro applies a half crab on Jordan. Both men are back up and Cesaro delivers a couple of uppercuts. Jason tries to fight back with a couple of belly to back suplexes. Jordan delivers a modified Perfect Plex and covers, 1,2 but Cesaro kicks out. Cesaro attacks the leg again, then Jason is down leaning on the second rope, and Sheamus hits him. Rollins takes out Sheamus on the outside. In the ring, Jordan delivers the belly-to-back neckbreaker for the win. We go to Sheamus and Cesaro in the locker room. Cesaro says that Kurt should be more grateful for what they did. 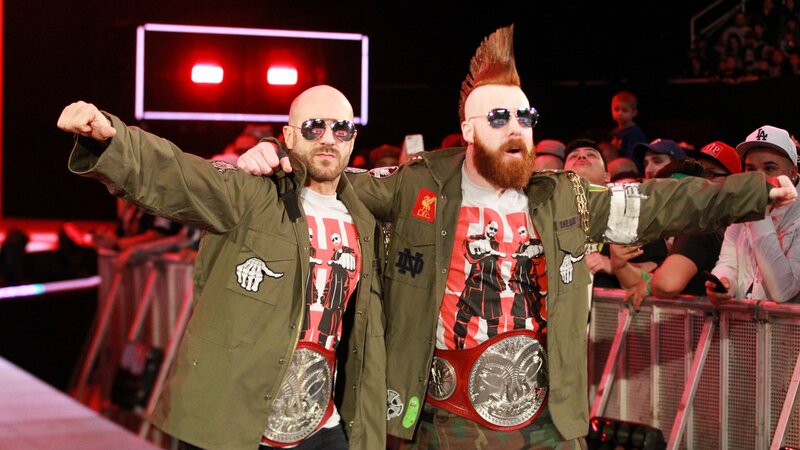 Sheamus says he is grateful for Cesaro and he has a gift for Cesaro. Cesaro opens the gift and it is a Dean Ambrose action figure with the missing arm. Cesaro has a gift for Sheamus. Sheamus opens the present and it is a Seth Rollins action figure. Sheamus is looking forward to breaking it the way he will break Seth later tonight. There is also a Jason Jordan action figure. Sheamus doesn’t want it and Cesaro says that Seth doesn’t want him as a tag team partner and Kurt does not want him as a son. Jordan and Sheamus start things off and Jordan with a waist lock take down and he gets a near fall. Sheamus with an elbow when they get into the ropes and Cesaro with a shot to Jordan. Rollins makes the blind tag and he hits a double cross body. Rollins with slingblade to Cesaro and then he hits a suicide dive. Rollins with a boot to Cesaro and Jordan clotheslines Sheamus. Jordan returns to the corner and Cesaro grabs Rollins’ leg. Rollins kicks Cesaro away and Jordan tags in. Jordan with a clotheslines to Sheamus and a drop kick to remove Cesaro from the apron. Jordan runs Sheamus into the turnbuckles repeatedly and hits a running shoulder followed by an overhead belly-to-belly suplex for a near fall. Jordan knocks Cesaro off the apron and Sheamus with a rollup for a near fall followed by a clothesline. Sheamus with a back breaker and Cesaro with an elbow drop off the turnbuckles for a near fall.